The team has not had access to the internet since last Friday night and in fact since then they have travelled over the Southern Gat Mountains into the next state to get online. The mobile signal was also too weak to use data access, they may just as well have been on the dark side of the moon! Anyway, they have finally managed to submit a report covering the last few days. All is well and Carol has settled into the Indian way as if she was a seasoned traveller and experienced eater of hot food, even the breakfast has curry or spices. Saturday started much the same as other days, a string of people who come to ask for help, usually to meet a medical need. This morning a father came on behalf of his 14 year old son who needs expensive growth hormone treatment for three years; he is the size of a 7 year old. Saturday was a special day because it included some time with Shibu. He is a bystander for the ‘unknown’ people who have nobody to support them in hospital. No bystander, no admission. The team also had the opportunity to do just a little tourism too and to meet people with kidney problems. Every month either Tom or Philip will meet the patients in the Indian Coffee House just over the road from the Trivandrum Medical College Hospital. This month’s session coincided with this visit. In the recent past the patients received medicines but that has become difficult so now HHI give them sufficient funds for either anti-rejection medicine or dialysis. There were others there too who needed help for other ailments. Some of the patients also ask for prayer so Edmund and Tom deal with the ‘business’ and Chris with Carol provided a prayer station. This session lasted about an hour and a half but the coffee shop serves tea so that makes everything better. Shibu joined the team and Tom and set off to the nearby café which also serves ice cream. Five sundaes, of different colours, sizes and flavours, all for five pounds (sorry no pound sign). Shibu went back to the hospital and the team went with Tom to Kovalem beach, about a 45 minute drive away. Tom watched as the team took a dip – some swimming and a lot of paddling. No time to dwell on relaxation it was back to Trivandrum. The team started their walk around to meet Shibu’s patients. The hospital is not a nice place to be, very hot and full of people as well patients. The first patient, Raju, has his discharge papers and about to leave. He had treatment for damaged lungs and was suitably patched up. Edmund gave him money to start up a small business and also the bus fare home and a month's rent. Rajan is a new patient, he has a broken leg as a result of a hit and run - coming worse off than the motorcycle and rider. The next patient was Ooni Krishna, another hit and run victim. Ooni has a broken leg with several pins in and his mother was his bystander. She was the wage earner in the family so Shibu helps her out and Edmund gave her some money. The next two patients were suspected to have TB and undergoing some tests. Edmund paid for a shirt and bed sheets for Francis and fruit for Rajesh. Yes, you are expected to provide your bed sheets here. On their way out a young boy patient waved and Chris went over to give him a knitted footballer doll thanks to the many knitting groups he visits in North West England. As night fell it was time for ‘home’, back to the Special Therapy Centre. The cause of the PC crash was discovered to be one of the children fascinated by the red and green lights on the back the PC and managed to change the colour a few times! Conversations over dinner vary widely, sometimes HHI business, other times funny stories and even Brexit. Chris brought some nougat out for Tom and Philip – the northerners, Chris and Carol say Nugget (sic) and the posh ones say Noogar. This has become a running joke with the team. Sunday started like all the other days, the procession of people seeking help. Then it was off to worship. The team covered all options – two went to a Pentecostal church frequented by Tom; Carol and Chris went with Philip to the nearby Roman Catholic church. One took over two hours and the other an hour. After the service Tom and Edmund spoke to about twenty people looking for a small handout for food and Tom wrote out some ‘chitties’ to enable people to go to a local pharmacist and get their medicines which HHI pays for. The two groups travelled separately in tuk tuks (or autoricks to some – the posh ones). It was Carol’s first long journey in a tuk tuk – about 45 minutes of white knuckle riding. Thanal House is the home for destitute women, now limited to 25 as stated in Government regulations. Carol was particularly interested in seeing this project as her Soroptomist friends in Coventry have donated funds in recent years. Many new changes have now finished and the place looks much better – brighter and cleaner. All the beds, painted by HHI volunteers two years ago, are still in good order on tiled floors in bright rooms with tiled walls. All the medicines are now kept in a locked cabinet, the women’s clothes and bed sheets are neatly folded in personalized glass fronted cabinets (see photograph). A door now allows the women to move directly from their sleeping quarters into the day room and dining area. A new door also provides direct access to a new toilet and shower block. HHI will fund the lining of the septic tanks so the new facilities can be used. It doesn’t end there, Shalini who runs the centre with her husband Shanil has new plans for more living space and a kitchen so we look to our supporters to help us sometime in the future and HHI will also look for grant funding. Whilst there, a group of young people from a local church came with some food and showed a keen interest in what the women were doing. Some were watching TV which is great to see as it was for the team to witness Indian people helping Indian people who are in great need of help. These visits always end in entertainment, cake and tea. The women sang and danced and the team responded with some well known nursery rhymes. Shalini shared some good news of a further two women reunited with their families, recognized as a success of the care and compassion shown at Thanal House. Home by tuk tuk in the dark, now there’s an experience not to be missed! Monday started as all days do – a group of people at breakfast time, waiting to speak with Tom and seek help. As a result of this morning’s work HHI started four women in business; one will sell cloth in local villages, two will start up basket weaving and the other will sell fruit and fish, door to door. Another visitor, Shinu 18 years old, was born neither male nor female. HHI have helped with 5 operations already and will continue to support Shinu. The team then set off for Indijar up in the foothills of the Ghats. On the way they visited Presana who received a cow last year. He now has two pregnant cows and a goat so HHI have clearly improved the living standards for Presana and his family. It is always surprising when visiting such houses as Presana’s; quite dark dingy but the woman of the house always dresses in a bright coloured Sari. Indijar is where CDSA charity has tuition groups, supported by the Banyan Tree. The team went to observe the work and look at a recent problem on behalf of Banyan Tree supporters. 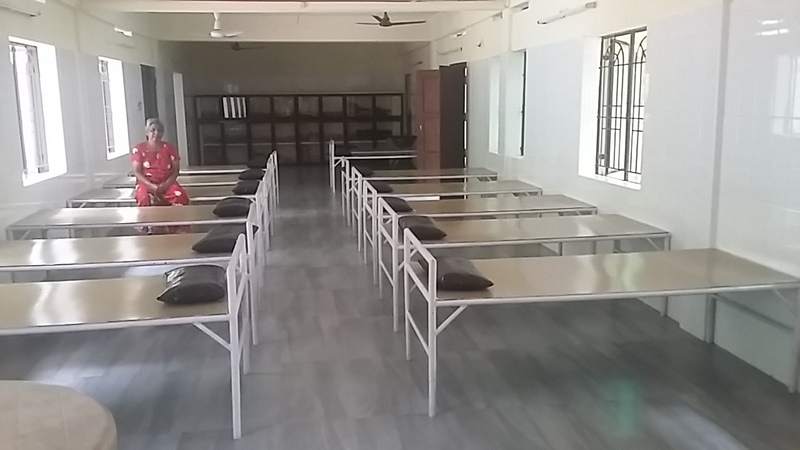 There is purpose built building for tuition and a room for sewing training. What is the problem? Recent road alterations have resulted in a large drop from the driveway in front of the building to the road. It was also an opportunity to see the tuition groups in progress. 60 to 65 children come for an hour before school and after school. The students’ dedication to learning and of course the teachers, has resulted in a 100% pass rate over the last seven years. The team got home just before dark, far too early for Edmund but plenty of time for more discussions over dinner with Tom and Philip. On Tuesday Tom and the team set off for Asha Kiran Ashram in Tamil Nadu. A three hour bus ride over windy mountain roads – you pay a lot of money for such a ride at a funfair! The bus ticket cost about a pound each but more about that another time. The next post, providing the PC is fixed will be tomorrow night – Thursday - and will include a report of our visit.